Pasture Song Farm was named for our admiration and love of pasture. The sound of tall grass shifting and swaying in the wind is music to our ears and brings feelings of awe and contentment. These feelings that arise while in an open pasture, or savanna, seem to be universal. The quiet beauty of the pasture song is emblematic of the goodness that grassland brings to land and to people. The main component of this goodness is the regenerative nature of pasture. Grasses and legumes, the primary components of pasture, act symbiotically to sequester carbon into the soil and feed soil life. This builds robust and healthy soil, and is critical to the success of our crop rotations and ultimately to our success as farmers. Pasture plays a central role in our farm. We raise our livestock on pasture, which provides them with a clean, nourishing environment. We use pasture in our crop rotation, to improve soil health and tilth in preparation for grain crops. We've combined livestock, pasture, and grain crops into one rotation, which is creating positive synergistic effects that are only just beginning to reveal themselves. These practices are the root of how we farm. We are committed to creating sustainable systems that engender healthier land, healthier products, and a healthier community. 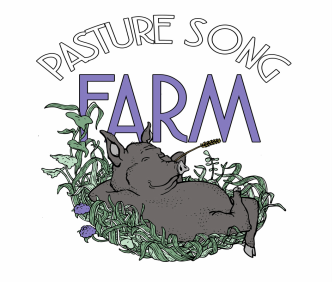 Pasture Song Farm is owned and operated by Jeremy Dunphy and Clara Osborne. Jeremy Dunphy is the project leader and coordinator, as well as the resident mechanic & fixer-of-things. He leads the crop planning and executing, as well as composting and field fertility. As Clara says, he's always doing something, whether it's fixing, tweaking, or building things. He grew up working on local farms and helping with his dad's business. After grade school at the Kimberton Waldorf School, he went out west to pursue extreme outdoor activities, and studied exercise physiology in Montana. He has a strong entrepreneurial spirit, starting a painting business in high school, and then Seven Stars tree service after he returned home from college. When he got together with Clara, starting an agricultural business seemed the natural thing to do. Clara Osborne is the farm's boss hawg, according to Jeremy. She orchestrates the livestock raising and pasture management, and cut flower production. She handles most of the marketing, sales, inventory, and customer relations. Clara grew up in southern Lancaster County, spending much of her childhood out in the woods, meadows, and creeks, which instilled in her a strong love of the land. Curious about city living, she went to study in the heart of Manhattan, at New York University. She spent two semesters there, during which she had an "a-hah" moment that she wanted to farm as a living (go figure). She transferred to Warren Wilson College, where she studied sustainable agriculture and worked on the college livestock farm. This is when she found her calling. She then returned to her native Pennsylvania and worked on several grass-based dairies and a flower farm specializing in bedding plants. We officially started Pasture Song Farm in the fall of 2014, when raised our first batch of hogs in Jeremy's mother's backyard. We expanded our farm in the spring of 2016, when we moved our operation down the road to Lundale Farm, in northern Chester County. We currently farm about 90 acres of rolling, loamy land.